A test of the X-movement showed that the board is capable of a travel speed of 6 meter per minute. The test was performed with a 50 Kg load on the board. The penalty for a stop plus a start phase was around 0.5 seconds. In order to achieve this speed and still have an accuracy of a few micro meter, the EMC2 software must run on a computer with good real time properties. I do not know what I should buy. My reasent findings shows that acceleration could be much faster and that the main issue that concerns the pulses to the stepper drives may not be a problem for my 10 years old computer. The problem of rare occations of delays may cause the next puls to be issued too soon and thus vilolate the minimum requirement of time between pulses to the stepper driver. However it seems like this computer is not able to handle time increments shorter than 10 us which is ok since my drivers are ok with 5 us during the worst case. Maby this nice property is special for this old computer so that the problem is to be taken care of for a new faster computer. A possible solution could perhaps be a simple hardware fifo that clocks the output at a proper speed. How does the tool holder lock into position? 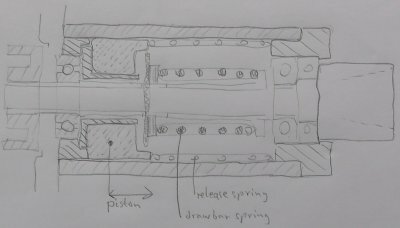 The picture shows the major parts and dimensions that are involved in the locking mechanism. The ball grip device has a long M5 screw so that the exact position into the draw bar can be adjusted after assembly. The draw bar has a spring that is preloaded to 300N. A pneumatic piston push the draw bar a few mm so that the three balls moves out in the conical part of the spindle nose which leaves the center hole wide open for the top nob of the tool holder to move to the rear side of the balls. 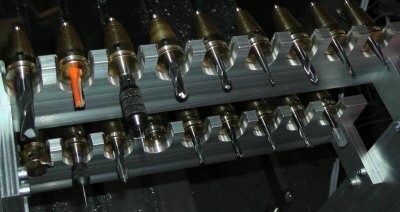 The spindle is pushed against one tool holder in the set of 18 tools where this entire arrangement will push back due to its elastic position. The tool holder push out the balls when space in the conical part allows them to do so. When the pneumatics let the draw bar move back into the spindle again, the tool holder is locked and hold into the conical spindle nose with at least 300N. 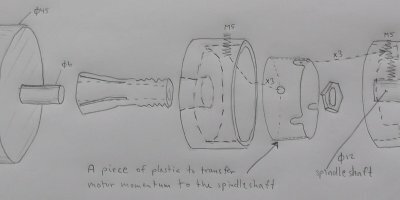 What is the connection between electric motor and the mechanic spindle part? Where is the pneumatic piston mounted?